According to a Unicef report of 2005, more than one hundred million children world-wide do not have a basic school education. At the same time, India is on its way into the computer age. Much of our technology is actually produced there, fuelling the demand for good specialists in the country. Education is a must! So much tax money and private aid has been spent on development projects in India and elsewhere. Sometimes with little impact, thus raising the question whether that money could not be used more effectively by supporting the young generation at an early stage and giving them a good education. Helping the local population to find their own way out of poverty is the way to go, not just donating money. According to an American study, each Dollar invested into early education projects pays off 17-fold by knock-on effects such as curbing crime, and raising local occupation levels. Even today, children are sold off like slaves to sweat shops, such as carpet manufacturers. Girls have to serve old men as "temple dancers", instead of attending primary school as they should do. ran around with their loot, children with bamboo canes chasing behind them, shouting. In the evening, camels could be seen through the window, passing through the small lane. Brahm Datt's wife, Suman, was preparing sweet Cai on the oven in the yard, fuelled by dried cow dung. I learned that you can exchange 300 dried cow droppings against one chicken. Unless, of course, you want to use them as fuel or, mixed with clay, as mortar. 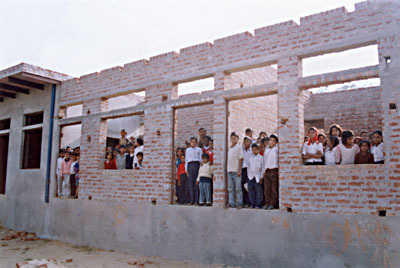 Brahm Datt Sharma had rented a plot of land from the local community years ago, and built a small private shool on it. The pupils, there, learn a lot more than in government schools with their low-paid teachers just waiting for a career-move to take them to the next place. attending his school. He tries to save children from being discriminated just because of the financial situation of their parents. For example, in difficult circumstances, payment of school fees may be delayed until the crop has been sold. There is a large number of uneducated women who are completely on their own in life, with hardly a chance to earn a good living. All too often they are being thrown out of the family home, together with their children. Be it because their husband died, or simply because he wanted to get rid of them. While the practise of burning widows is officially banned these days, it has not completely stopped to exist in remote areas. Even in the capital, Delhi, "cerosine accidents" are frequently reported in the newspaper. Mothers begging with their children are a common sight in the streets of India, poverty and sickness are ubiquitious, a hopeless fate for many. On our first visit to Brahm Datt Sharma's school, Peter and I noticed once again just how high our standards are in Western countries. About 320 kids of varying age were crammed into three tiny rooms, crouching on the floor. The older ones had to use the yard, exposed to the stinging heat of the sun - not a good environment to study. Booklets had to be placed either onone's knees, or on the back of the next student. All this did not stop three brave lads from citing famous Shakespeare quotes and Indian poems, thus honoring their guests and, at the same time, underlining the high ambitions of the school. That was the moment when Peter and I decided to become engaged into a development project and help those kids. 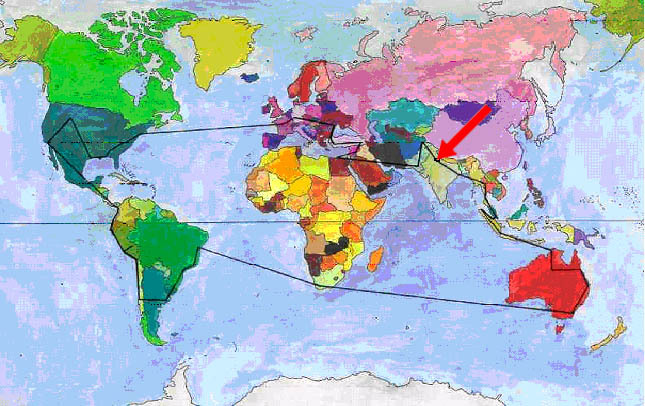 English being an official language of this vast country, it should be a good investment to further that skill as well as education in general. Education is the key in fighting unemployment, poverty and the miserable health situation. Informed people will understand the connection between hygiene and the spread of diseases. They will have a better chance to fight their way out of poverty. For educated people, a career and prosperity becomes a realistic perspective. Every so often we donated money for books, and writing material, but it always came short of the real needs. When Peter died in 2001, I decided to push the project and ask my friends to become involved. With the help of Brahm Datt Sharma, who had become a good friend by then, I wanted to build a new school in Bah. The people in the village should be helped to help themselves, was the idea. As far as possible, it should be built by locals, using local supply for construction material. That should bolster the local economy and create jobs for a few unemployed, at least. Harking back to the origins of the project, Brahm Datt Sharma and I chose the name "Peter's School" for the new elementary school. In November 2002 the first charity event for the school took place in Freiburg i.Br., Germany. My friends who had helped me organise it brought along their friends, which got us finally some 200 visitors, crammed around the buffet, and the bar, enjoying the cultural programme. The latter included professional artists like Hartmut Schmidt. He staged some remarkably complex dancing, and narrating, and explained its role in the Hindu tradition. The Indian musician, Ranjit, worked on the tabla drum quite professionally. The raffle featured as a first prize a large traditional water pipe from Saudi Arabia. On the cultural side, a slide show as well as some melodramatic 'Bollywood' movies helped to get into the mood. Many helping hands made the evening a great success. Friends had prepared Indian food for other friends to buy and enjoy it. Souvenirs from around the world were on sale just as there were brand new Indian clothes, or postcards, donated by the photographer, Heike Pirngruber. Just over 2000? net profit were the result of the event - a first step had been taken! showed up, and construction work began. 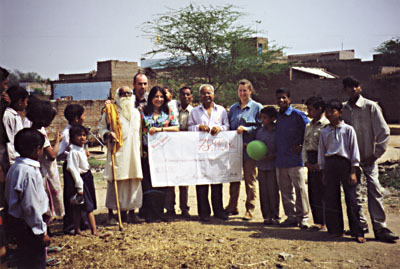 Together with Diana Diaconu, Gabi Goll und Rudi Kleinhenz, I brought the capital raised in the first phase to India in March, 2003. First thing after arrival, we ordered construction material and builders, who took up work immediately. Given the necessity of saving costs, it was often amazing just how much they achieved by simple means. Rather than using machines, they crouched on the floor, hammering the loamy soil so it would form a solid base. Scaffolding is made of bamboo canes, on which bare-footed men move deftly. Material such as brick, mortar, sand, etc., is delivered by local family-owned businesses, often on ancient tractors, or carts pulled by water buffalo. Quite often, Brahm Datt Sharma would strike a good deal with the suppliers by promising to educate their children. 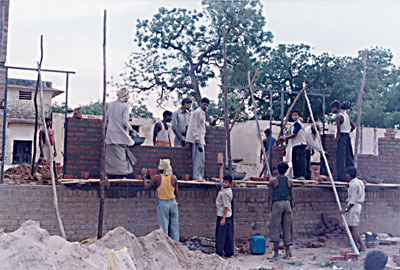 In June, 2003, Jan Konopatzki, brought more donated money to India, checking the progress and documenting it with photographs, on the occasion. When I returned in April, 2004, together with Peter Krämer, for the hand-over of more donations from acquaintances, I was happy to learn that the ground floor with six class rooms was already there. It even featured a toilet - so far, you had to go "to the field" for such needs. There is already quite a list of new registrations from parents who got to know that in the “school of the friends from Germany” the standard of English classes is higher than at public schools. To live up to these expectations, we need qualified teachers with a good command of the English language. Back in Germany, I was delighted to receive more donations from members of the DZG (Deutsche Zentrale für Globetrotter) as well as from a “Globetrotter” meeting in Bad Kissingen. The latter one had been organised by Rudi Kleinhenz, who also wrote an article about the school for a local paper (in addition, the Badische Zeitung of Freiburg i.Br. reported about the project in 2005). We believe this aid project is worth all the effort. From the perspective of a donator, the transparency, and in the absence of costs for administration or transportation by private travel). There is no commercial interest in the project. I do not earn from it, nor does anybody (else?). To build up a school that can eventually be sustained by the contribution of parents, that is the goal. A school in which children know how to work with computers and how to express themselves in good English. That is what I am working for. compacted by the application of plain hammers rather than dedicated machines. And yet, it will be a safe building! The construction is checked upon regularly. Visitors pay by themselves for their tickets so that all donations can go directly into material for construction and teaching. All spendings are verified by receipts. The kids are already waiting for the teaching to start, and thus to pave their way into their adult life. Each of them should get their chance! On one of my visits, I asked the mayor of Bah about the poor sanitary conditions of the village’s small bus station. Then, the community took matters into their own hand and rebuilt the toilets, refurbishing the whole station on the occasion. Anyone who had travelled on busses in India, will appreciate the difference. The village is making progress, and everybody is involved! Does this all work out? Yes, it does! As you can see from the photographs, progress is being made. This is just about people being better off to help the disadvantaged people, nothing more – and nothing less! Please, make your contribution to help us support the school until it can carry on by itself. Thank you. Also in the name of the kids in India.